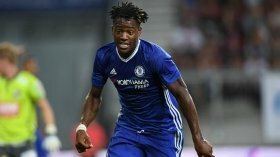 Crystal Palace have reportedly set their sights on signing Michy Batshuayi from Chelsea after witnessing their loan move for Liverpool's Dominic Solanke fall through. Earlier this week, Solanke had been fancied to seal a temporary move to Selhurst Park for the season with reports suggesting that a medical is close to completion. However, the deal is no longer expected to happen this month with the Eagles said to want a ready striker unlike Solanke, who has been struggling with a muscular problem. According to The Mail, the south London outfit have now shifted their attention to signing Batshuayi, who has struggled during his temporary stint at Valencia. The Belgium international has netted just one league goal during the first half of the season and the Eagles are hoping to convince the Blues into terminating the loan move so that they can sign him. Aside from Batshuayi, the Eagles have also been linked with a possible move for Chelsea's Tammy Abraham, though the Blues remain reluctant to recall him from his loan stint at Aston Villa.